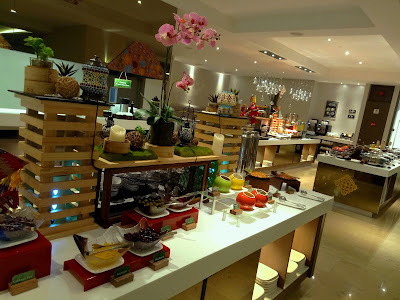 Special thanks to Olive Tree Hotel for extending this hotel review invitation. 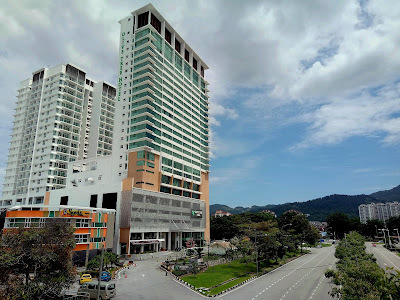 Olive Tree Hotel is a 4-star hotel in Bayan Baru. 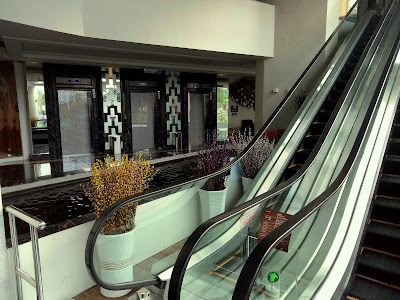 Thanks to its proximity to Bayan Lepas Free Industrial Zone, the hotel is a popular choice of accommodation for business travelers and expatriates. 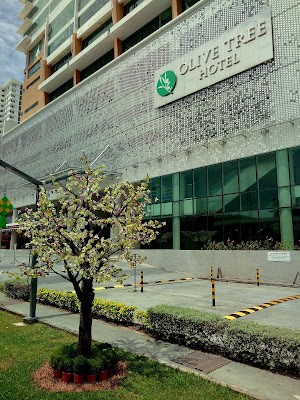 Another advantage that Olive Tree Hotel enjoys is its strategic location near Setia SPICE Convention Centre. The hotel's facade is decorated with metal leaves which seem to ripple in unison with the wind. The main entrance leads to a large lobby with a mezzanine floor above. Suspended from the ceiling are colorful lights that resemble a flock of sparrows. Olive Tree Hotel is a certified green building. To minimize its impact to the environment, the building was constructed using sustainable and recyclable materials. Most lighting and escalators are activated by motion sensors. It is also important to note that Olive Tree Hotel is a 100% smoke-free hotel. 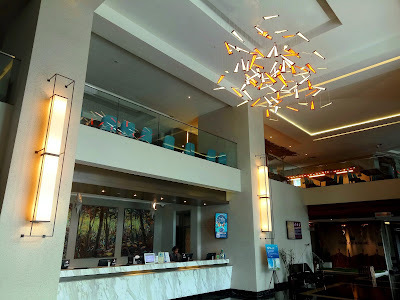 Smoking is strictly prohibited in guestrooms and all common areas. 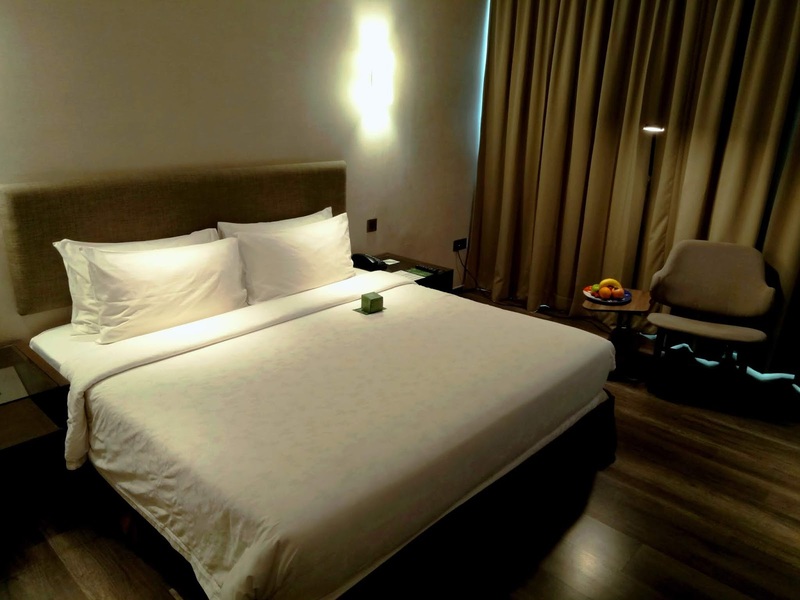 In total, Olive Tree Hotel has 240 guestrooms across 5 different categories. For this review, I am staying in a Deluxe room. The room comes with a king-size bed with a Chiro-Tech Coil mattress. 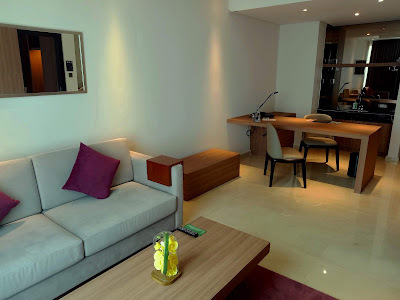 In-room conveniences are 40-inch LED television, high-speed Internet access, a writing table, a safe, a clothes iron, an electric boiler and a minibar. The Executive Deluxe is slightly larger than Deluxe room and offers a better view as there are more windows. Its bathroom is furnished with a bathtub in addition to a shower stall. Basic toiletries like dental kit are provided. 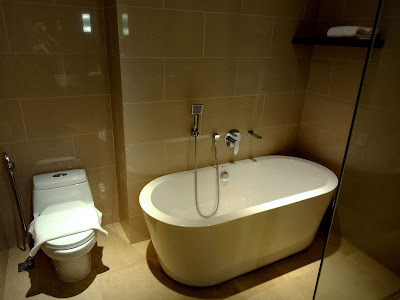 Finally, the Executive Suite offers a premium class of accommodation. 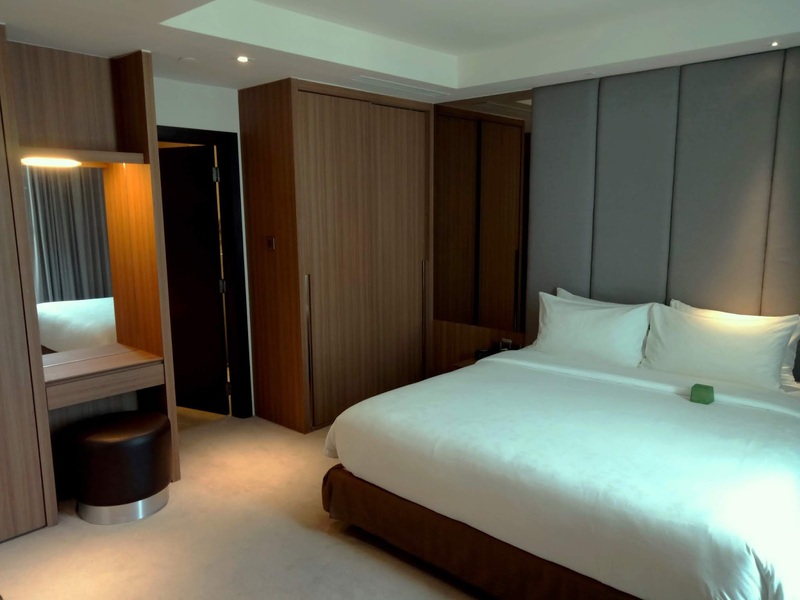 Spanning twice the size of a Deluxe room, the Executive Suite has partitions for the bedroom and living room. 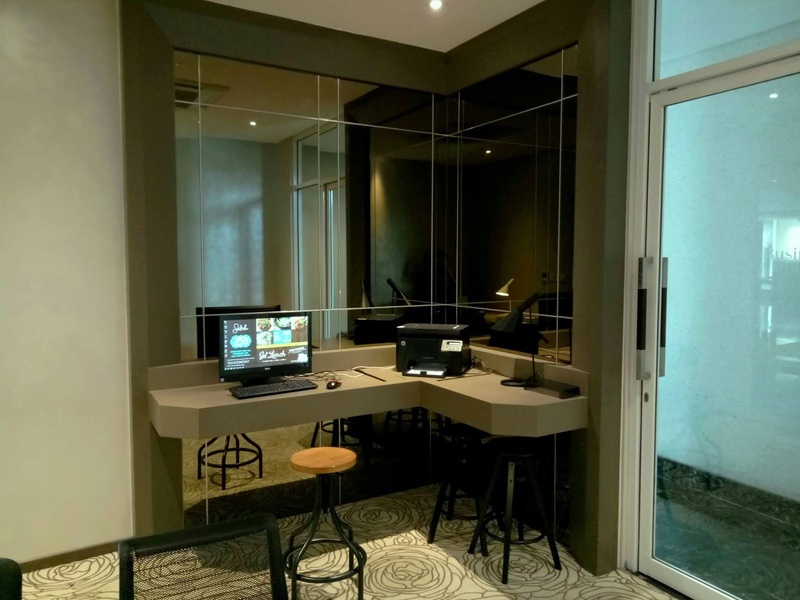 This is particularly convenient for business travelers who need to conduct some work in the comfort of their own rooms. At the living room, the suite is furnished with sofa chairs, a large office desk and a small kitchen. Speaking of kitchen, guests who do not wish to leave their rooms can always order food from the 24-hour room service menu. 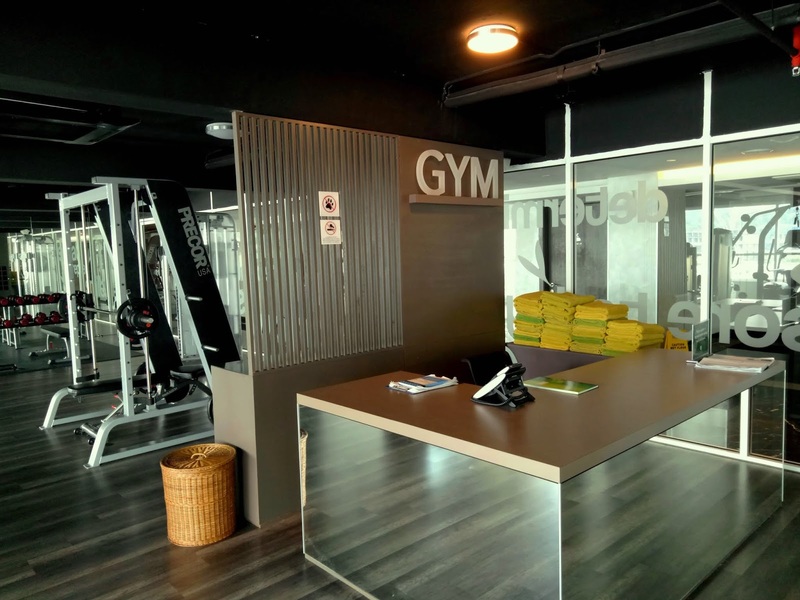 Olive Tree Hotel's fitness center is located at Level 8. 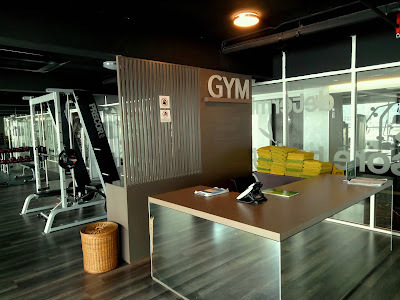 The gym is open from 5:00am to 12:00am and requires a keycard to access. There are over a dozen pieces of exercise equipment including treadmills, stationary bicycles and weight machines. Clean towels are provided for guests' convenience. 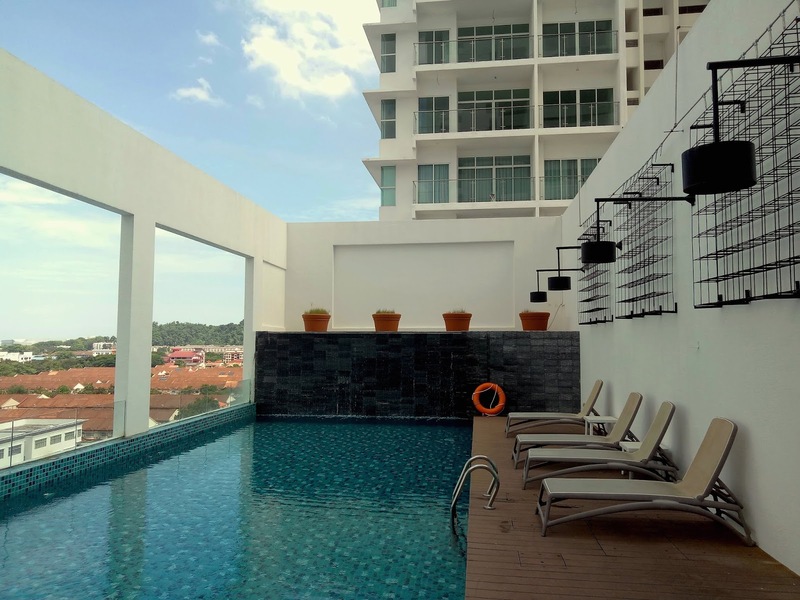 The hotel's swimming pool is also located at Level 8. It is open from 7:00am to 8:00pm. There are no lifeguards on duty, therefore children should be supervised at all times. On the wooden deck next to the swimming pool are several sunloungers where guests can enjoy some fresh air. Olive Tree Hotel's Grand Ballroom has two levels. The mezzanine level is an ideal venue for cocktail receptions. Combined, the ballroom can accommodate up to 60 tables in a banquet setting. 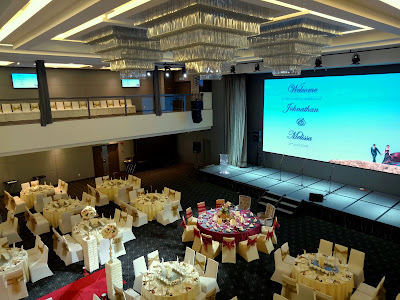 Wedding packages start from RM888.00+ per table. 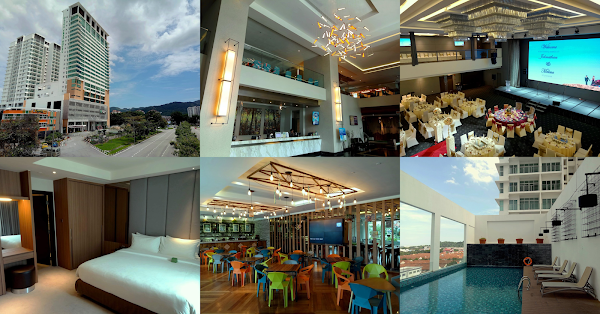 The hotel also has several smaller function rooms on Level 6. The business center is equipped with a computer terminal for guests to browse the Internet. There is also a printer where guests can print airline tickets. Speaking of transportation, Olive Tree Hotel provides complimentary shuttle service to popular destinations like Queensbay Mall and Beach Street (Lebuh Pantai). Check with the concierge for the shuttle's schedule. 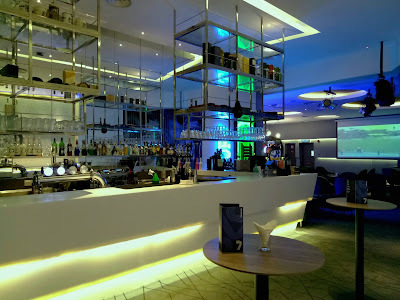 Open daily from 5:00pm to 12:00am, 7 Lounge is a nice place for guests to mingle. The sports bar serves both alcoholic and non-alcoholic beverages. A roaster of music bands performs here every Saturday evening. 7 Lounge has a large projection screen where guests can catch the latest sporting events around the world. Other forms of entertainment are air hockey and arcade games. 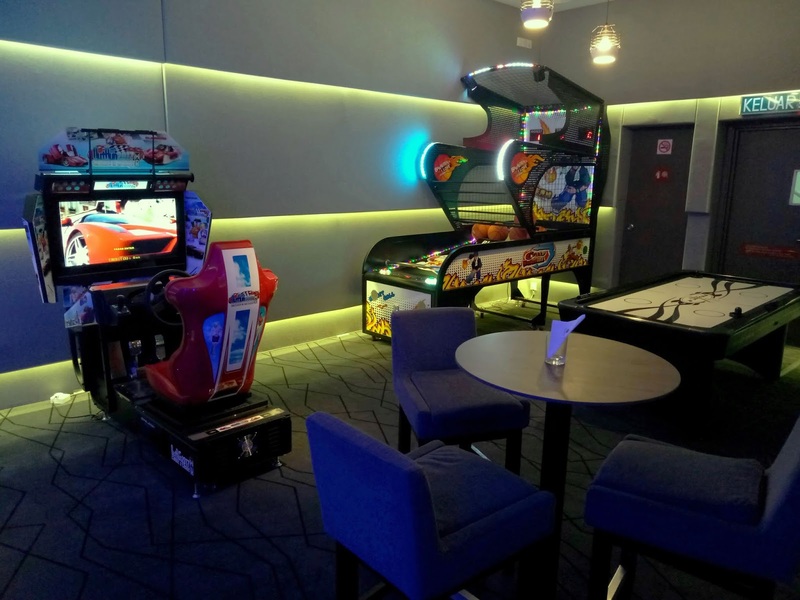 In addition, 7 Lounge has several board and card games for guests to pass the time. 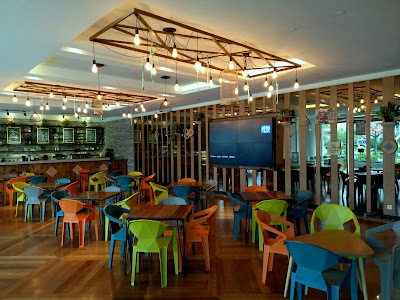 As for quick bites and coffee, Selah is a casual eatery next to the lobby. This is also where the Brazilian BBQ is served every Friday evening. By the way, Selah is named after the Hebrew word "סֶלָה‬", which means "to pause" or "to reflect". Directly above Selah is Sukkah Coffee House. This is the hotel's all-day dining restaurant. Breakfast is served here from 6:00am to 10:30am every morning. It is good to start the morning with breakfast cereals. 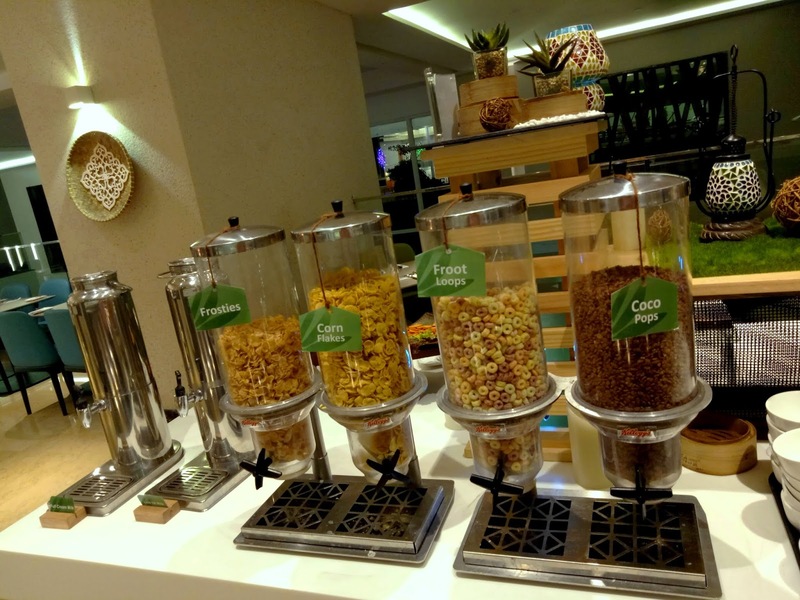 Familiar brands like Corn Flakes, Frosties, Froot Loops and Coco Pops should appeal to most people. Fresh milk is also provided. As for Nasi Lemak, the rice is cooked with coconut milk to attain a lovely aroma. The succulent chicken rendang goes well with it. 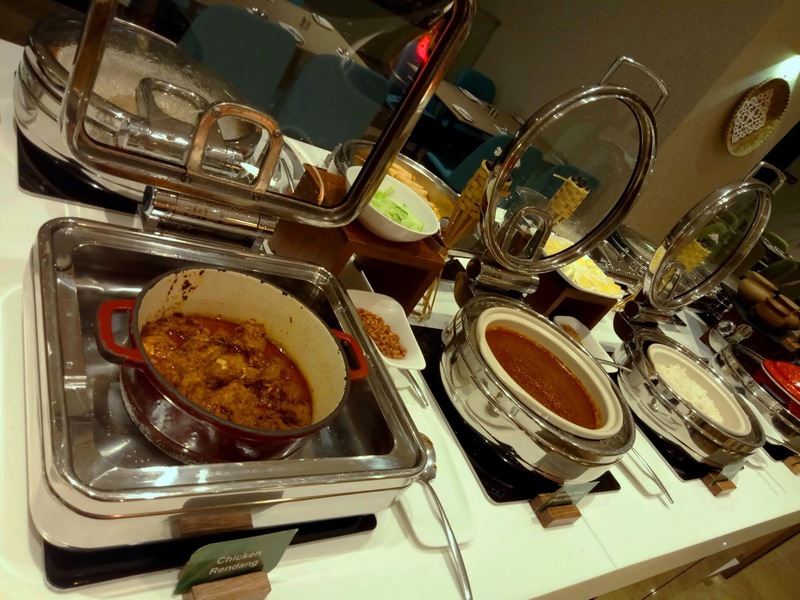 Other ingredients for Nasi Lemak are sambal tumis (chili paste), fried anchovies, roasted peanuts, cucumber and hard-boiled eggs. 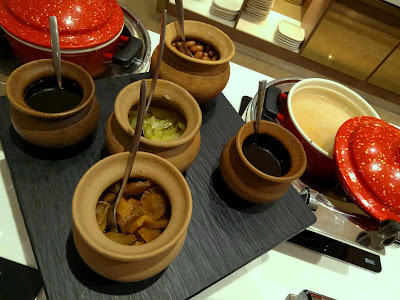 Congee comes in 2 versions: plain and corn. Condiments to go with the rice porridges are preserved vegetable (榨菜), picked lettuce (香菜心), peanuts, soy sauce and sesame oil. Meanwhile, other Chinese dishes are dim sum (点心), steamed bun (包子), spring rolls (春卷), braised vegetable and fried rice. 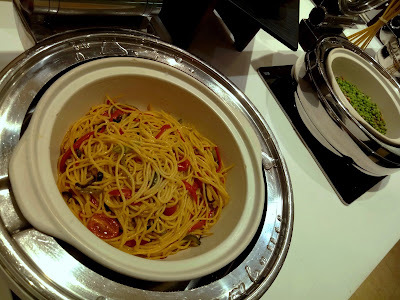 As for something Western, Pasta Aglio-Olio is prepared this morning. Other popular Western breakfast items are fried eggs, cold cuts, sausages, hash browns and baked beans. 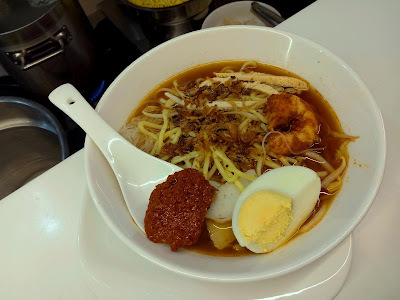 Penang Prawn Noodle (槟城福建面) is prepared using shrimp-flavored broth. Other key ingredients for this popular hawker dish are yellow noodle, rice vermicelli, shrimps, shredded chicken, fishcake, hard-boiled egg and fried shallots. A spoonful of chili paste may be added for the extra spiciness. 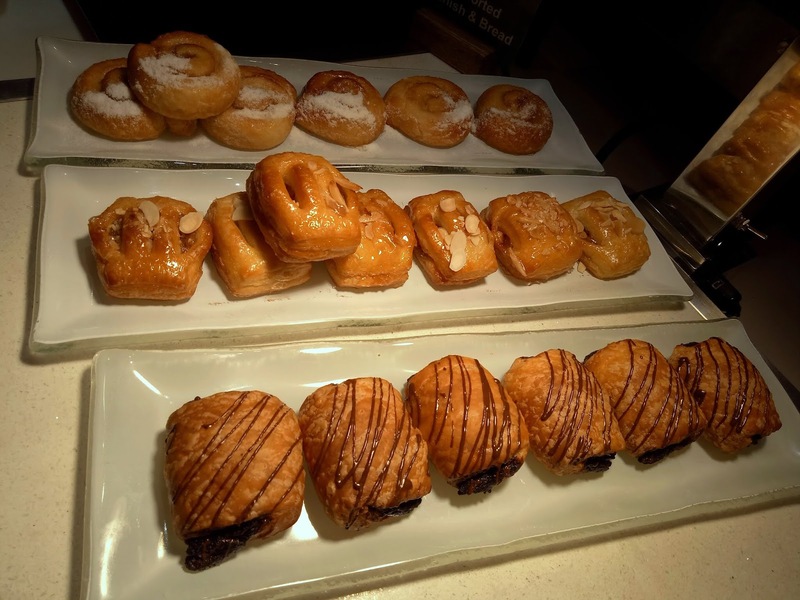 Moving on, the pastry section presents a variety of Danish pastries, croissants and muffins. Bread is also available in loaf and sliced forms. A conveyor toaster and a toaster oven are conveniently placed nearby. At the desserts counter, fruit cocktail and low-fat yogurt are served over ice so that they remain chilled. 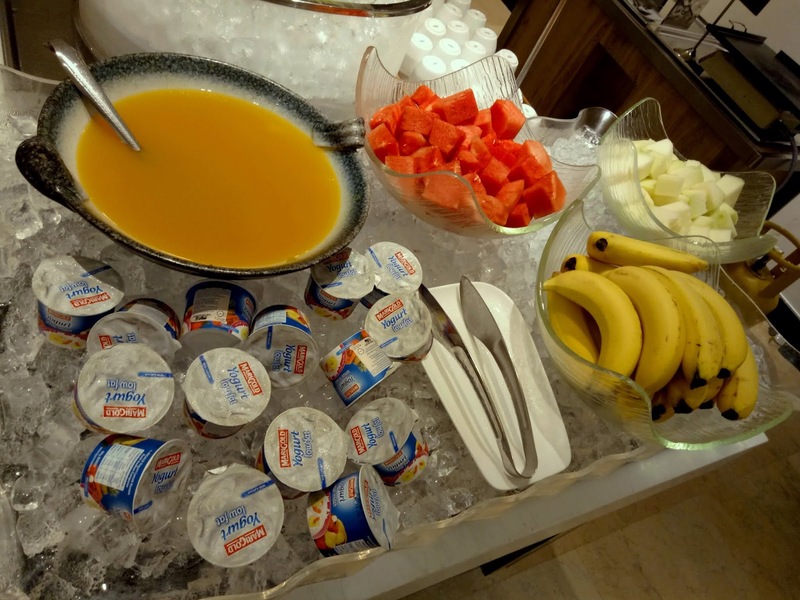 Also included are cut fruits such as banana, honeydew and watermelon. 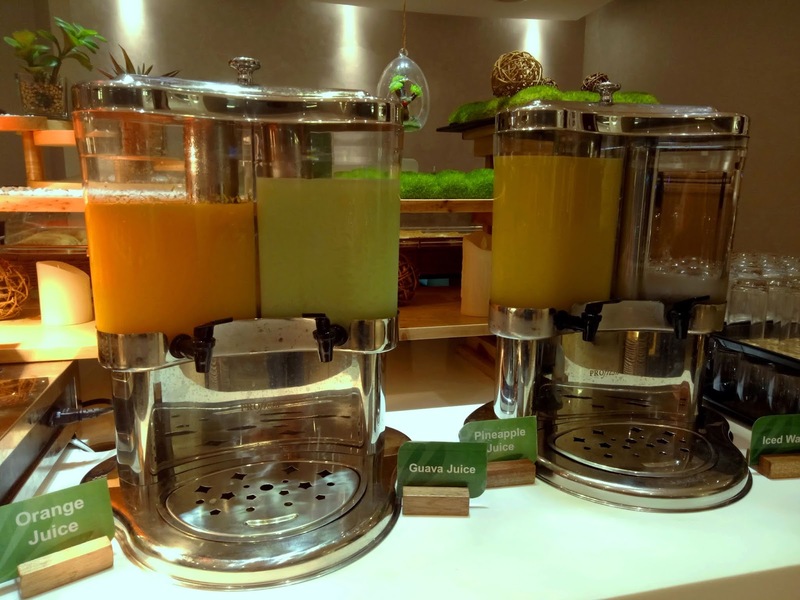 The drinks dispensers contain thirst-quenching orange, pineapple and guava juices. As for hot drinks, guests can help themselves with black coffee and tea. There is also an espresso machine for guests who need caffeine shots. Olive Tree Hotel provides a commendable level of hospitality for a 4-star hotel. 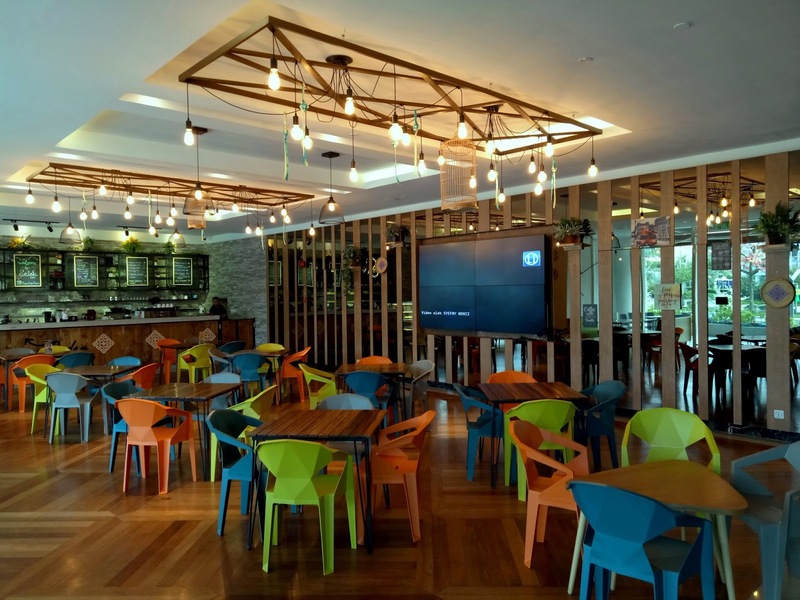 As the hotel is relatively new, its amenities are in good shape. Would-be guests should make room reservations through the hotel's website to enjoy the most attractive rates. The check-in and check-out times are 3:00pm and 12:00pm respectively. Directions: Olive Tree Hotel is located at Bayan Baru, just across the street from SPICE Arena. The hotel provides complimentary parking for hotel guests.